^ Sapulkas, Agis (June 11, 1996). "Exxon Moves On Sakhalin Oilfield Deal". The New York Times. Retrieved March 2, 2018. ^ Scheyder, Ernest; Soldatkin, Vladimir (February 28, 2018). "Exxon quits some Russian joint ventures citing sanctions". Reuters. Retrieved March 2, 2018. ^ "Exxon Mobil eyes multi-billion dollar investment at Singapore refinery | Market Report Company - analytics, Prices, polyethylene, polypropylene, polyvinylchloride, polystyrene, Russia, Ukraine, Europe, Asia, reports". www.mrcplast.com. Retrieved April 3, 2019. ^ TopBlog. "Energy Choices: ExxonMobil - Exxon Energy". Energy Choices (in Indonesian). Retrieved April 3, 2019. 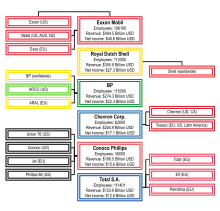 ^ "Financial operations overview and highlights | ExxonMobil". ExxonMobil. Retrieved October 24, 2018. ^ "ExxonMobil Earns $19.7 Billion in 2017; $8.4 Billion in Fourth Quarter". ExxonMobil News Releases. Retrieved November 11, 2018. ^ "Exxon Mobil Corporation, Form 8-K, Current Report, Filing Date Dec 16, 2016" (PDF). secdatabase.com. Retrieved April 23, 2018. ^ Schwartz, John (October 24, 2018). "New York Sues Exxon Mobil, Saying It Deceived Shareholders on Climate Change". The New York Times. Retrieved October 24, 2018. ^ "Western Gray Whales Get a Break From Noisy Oil Development". Environmental News Service. April 24, 2009. Retrieved March 2, 2018. ^ "Exxon operations threaten endangered western gray whales in Russia". World Wild Fund. July 11, 2016. Retrieved March 2, 2018. ^ Sheridan, Kerry (July 11, 2016). "Deal with oil giant helps near-extinct whale recover". phys.org. Agence France-Presse. Retrieved March 2, 2018. ^ "Christie Aide Took Political Trips Before Exxon Settlement - NJ Spotlight". Njspotlight.com. Retrieved June 17, 2016. ^ Overland, Indra (2016). "Ranking Oil, Gas and Mining Companies on Indigenous Rights in the Arctic". ResearchGate. Arran. Retrieved August 2, 2018.